Tag line: "If He's Crazy, What Does That Make You?" While I can't say for sure, I'm guessing I've seen One Flew Over The Cuckoo's Nest about two dozen times. I’m as familiar with the characters in this movie as I am with any ever made, yet despite this familiarity, the film's often funny, occasionally tragic story never fails to move me. In order to determine if he’s mentally fit, prisoner Randall P. McMurphy (Jack Nicholson) is transferred from work detail to the state’s psychiatric institution, where many, including the administrator (Dean Brooks), believe he's faking insanity to escape the rigors of prison life. As for McMurphy, he's quite content with his new situation, and quickly befriends his newest bunkmates, including Billy Bibbit (Brad Dourif), a young man with a speech impediment, and a tall Native-American deaf mute he affectionately nicknames “Chief” (Will Sampson). But in this particular ward, Nurse Ratched (Louise Fletcher) is in charge, and she maintains a firm grip on every patient under her care. To stir things up a bit, McMurphy initiates a power struggle between himself and Nurse Ratched, challenging her authority at every turn, and in so doing gains the respect of his fellow inmates. 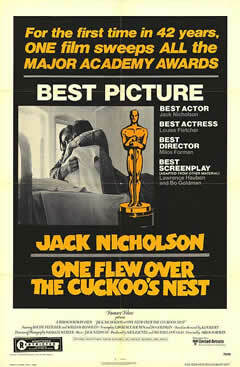 One Flew over the Cuckoo’s Nest is an effective blend of comedy and drama, telling the story of a man who fights a stifling system from within. A free spirit, McMurphy inspires the rest of the patients by standing up to the tyrannical Nurse Ratched. This is a key reason the film has remained timeless, and though freedom and rebellion weren't exactly original topics for films made in the '70s, One Flew Over The Cuckoo’s Nest had something the others didn't: R.P. McMurphy. In McMurphy, we're given a central character who isn't so much rebelling against a cause as he is a state of mind, and while many of the social issues from this time period are now relegated to the history books, this particular fight remains relevant even today. ...and a good deal more fishermen. This is Robert again Mr Shock coming over from your new post and Horror Jungle. I can not believe you have no comments on this movie. Maybe all horror peeps only coming to your blog. This is one of the best movies ever made. Exciting, dramatic, chilling, amazing some words come to me. Jack's best role ever to date and the Indian who Jack calls "Chief" is incredible, and lets not forget Nurse Ratchet. If a movie could ever be rated higher than 10, this would be the movie that topped it. @Robert: I couldn't agree more with your opinions on this film. It's one of my all-time favorites. Nicholson is incredible, as is every member of the cast (along with the ones you mentioned, another fine performance is that of Christopher Lloyd, who plays the deranged Taber, and Scatman Crothers' brief but hilarious turn is tremendous). You're right...a new rating system will have to be invented for films like ONE FLEW OVER THE CUCKOO'S NEST...10 just isn't high enough. Thanks for spending some time checking out the blog. I do appreciate it. I was Lucky Enough to Be One of the Few People in My English Class Who had Already Seen the Movie before We Watched it in School. One of My Favorite Books Out of Anything I'd Been Assigned to Read and a Very Practical Adaptation. Easily My Favorite of Jack Nicholson's Performances. Certainly Stands the Test of Time.